If buried treasure and fighting skeletons isn’t your thing, check out the Merchant Alliance in Sea of Thieves. These quest givers want you to capture wild animals and take them to an outpost, but it’s not as simple as it sounds. Sea of Thieves isn’t one of those games that talks you through all of its quirks, so it pays to go into it knowing exactly what you need to do. With that in mind, here’s what the Merchant Alliance is, where to find them, what the voyages are all about, and everything else you need to know about this animal-loving Sea of Thieves guild. 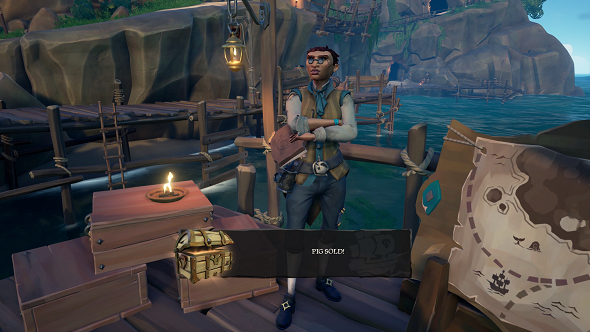 The Merchant Alliance quests are activated the same as any other quest – by grabbing a voyage from the guild tent, heading into the captain’s cabin, placing down the quest, and voting on it. It’s usually a good idea to keep your ship near the outpost where you got the voyage from, because you often have to head back to the quest giver to get the equipment needed to complete it. Check your instructions by heading into your right buffer inventory wheel, then head to the quest giver to grab your equipment. Say the quest is to capture two specific types of chickens and deliver them to an outpost, you will need to get those chicken cages first. Animals are found on islands. Just head to the nearest non-outpost island and have a hunt around. Listen out for audio cues and you will find the creatures in no time. Run up to the animal with your contraption and hold the right trigger to capture it. If you place the cage down, you can check the name of the creature to make sure you’ve bagged the right one. From there, it’s just a case of getting them to the place specified in your instructions. These voyages increase in difficulty later on by mixing up your cargo. Snakes can kill your other animals, so keep them stowed away separately. Also, be careful of keeping animals below deck – if your hull is breached, they can drown. It also pays to feed them bananas from time to time, or maybe play a soothing shantie to your snakes. For more general Sea of Thieves tips, hit up that guide. If you’re struggling with Sea of Thieves error messages, we have you covered there as well.